There's something very wrong with our pterosaurs. Figure 1. Click to enlarge. There are several specimens of Zhejiangopterus. My reconstruction was scaled to the smallest one, the one with the nice lateral view complete skull and mandible. I overlooked the fact that the other specimens were more than twice as tall. That was brought to my attention by a sharp-eyed reader. Earlier I scaled several azhdarchids. A sharp-eyed reader noted a size problem with the Zhejiangopterus specimen. There are at five specimens of Zhejiangopterus. The smallest has the perfect skull. That’s the one I used to reconstruct the specimen – and I scaled the genus to that specimen. That, of course, overlooks the bigger ones (Fig.1). My bad. The largest Zhejiangopterus was three times as tall as the smallest. If the largest was an adult, the smallest would have been a juvenile, not quite three times larger than a hypothetical hatchling. Of the pterosaur adults we know, compared to real and hypothetical egg diameters and pelvic opening diameters, adults appear to have been a constant eight times taller than hatchlings. 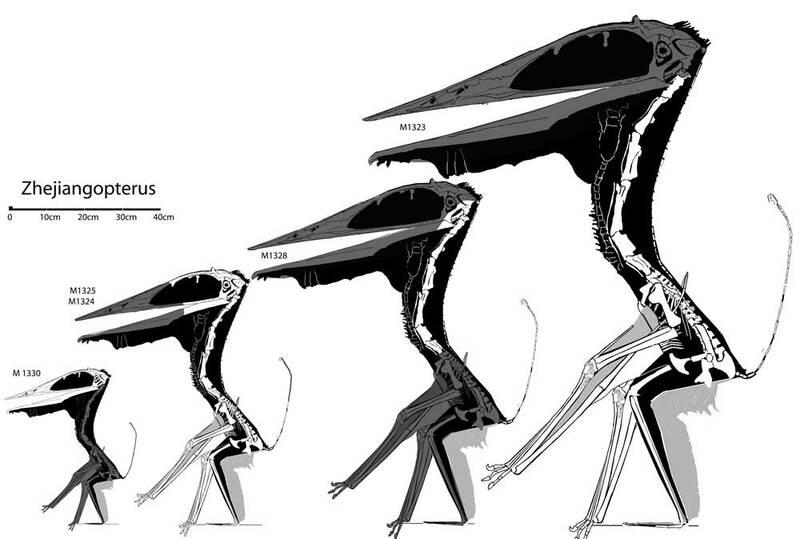 Most pterosaur workers will stake their careers on the “fact” that baby pterosaurs had big eyes and a short rostrum. That’s why they continue to refuse to include small Solnhofen pterosaurs in phylogenetic analyses. The littlest Zhejiangopterus does not have a short rostrum or large eyes. We can rely on the isometric hypothesis of pterosaur growth because embryo pterosaurs have adult proportions, unlike most other tetrapods. This growth series of Zhejiangopterus appears to confirm that. Isometric scaling was used to produce Figure 1. If someone wants to recreate this growth series with accurate tracings of the five specimens, that might be enlightening. As always, I encourage readers to see specimens, make observations and come to your own conclusions. Test. Test. And test again. Evidence and support in the form of nexus, pdf and jpeg files will be sent to all who request additional data. Cai Z and Wei F 1994. On a new pterosaur (Zhejiangopterus linhaiensis gen. et sp. nov.) from Upper Cretaceous in Linhai, Zhejiang, China.” Vertebrata Palasiatica, 32: 181-194. Unwin D and Lü J. 1997. On Zhejiangopterus and the relationships of Pterodactyloid Pterosaurs, Historical Biology, 12: 200. This entry was posted in azhdarchid, pterosaur family tree, pterosaurs and tagged azhdarchid, pterosaurs by davidpeters1954. Bookmark the permalink.